We are all eagerly awaiting the exhibition “DAYS OF THE DINOSAUR” at the CTICC, which gets to Cape Town on 31 July. Be prepared and bring the family along to the following talk at the CTSC – it will without a doubt enrich your visit to the exhibition when it gets to Cape Town! Dinosaurs (except for birds) have been extinct for sixty five million years. How then do we know so much about them? In this illustrated talk, Prof. Anusuya Chinsamy-Turan will unravel the tantalizing clues that tell us about dinosaurs and their world. Lucky Draw: Stand a chance to win 1 of 10 tickets to the “Days of the Dinosaur” exhibition. 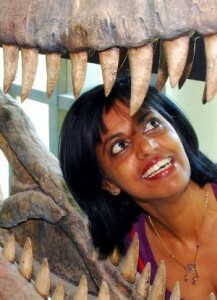 Professor Anusuya Chinsamy-Turan is a palaeobiologist and Head of the Department of Biological Sciences at the University of Cape Town. She is a global expert on the microscopic structure of the bones of extinct and extant vertebrates. Anusuya has been recognized by several highly acclaimed awards: For example, in 2005 she won the South African Woman of the Year Award, which acknowledged her contribution to science both in terms of research and science communication to the wider public. In the same year she won the “Distinguished Women Scientist Award” from the South Africa’s Department of Science and Technology. In 2013 Anusuya was awarded the World Academy of Science (TWAS) Sub-Saharan Prize for the Public Understanding and Popularization of Science. Professor Chinsamy-Turan has published extensively in scientific journals, as well as, in the popular press. She has published two academic books and a popular level book for children entitled, “Famous Dinosaurs of Africa” (RandomHouse Struik, SA). Currently she has another popular level book entitled “Fossils for Africa” that is in press with Cambridge University Press. There is no charge to attend the talk but donations are welcome. Booking is recommended. 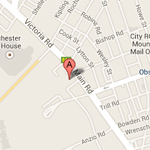 Please call 021 300 3200 or email info@ctsc.org.za to book your seat.